NOTE: This discussion applies to the use of termite baits in North Carolina. If you live outside North Carolina, you should contact your state/county Cooperative Extension Office, your state's land-grant university or state regulatory agency for local information concerning the availability and use of these products. A standard soil treatment may be illegal under federal, state and/or municipal regulations, e.g., when there is a well or cistern under or too close to the house. You prefer an alternative to soil treatments for whatever reason. Maintenance on a termite bait station. Because liquid treatments and bait treatments are applied (and also work) very differently from each other, it is difficult to compare the two methods in terms of which one works "better". Soil-applied liquid termiticides act essentially as chemical barriers to stop invading termites and to kill the ones that are actively infesting the structure. Termites encounter these treated barriers during the course of their normal underground foraging ("food hunting") activities. Some termiticides, such as those containing fipronil (Termidor®), imidacloprid (Premise®), or chlorantraniliprole (Altriset®), kill termites more slowly when the insects come in contact with the treated soil. Studies indicate that the "contaminated" termites may pass some of these non-repellent chemicals to other members of their colony which increases the overall impact of the termiticide. Just as with the use of ant baits, termite baits are only effective if the worker termites find and consume the bait and carry it back to the colony where it is "shared" with other colony members. It is important to realize that the current bait baits and baiting systems do not "attract" termites. The termite workers find the stations (and their contents) during their normal foraging (food "hunting") activities, just as they might find any other underground food source, such as the roots of tree stump. The acceptability of this "food" in the station results in more termites coming to feed on it. There is no way to predict how soon termites will find and feed in a bait station so an important part of the baiting strategy is to install the stations completely around the structure and to target known or suspected sites of termite activity (e.g., tree stumps near the house). For that reason, a thorough inspection of the house and immediate property is important before the stations are installed. Also, weather may adversely affect termite foraging. For example, very cold temperatures in the winter may reduce termite activity in the soil. If the soil becomes very dry (for example, during periods of drought), termites may move further down in the soil or stay in surrounding moister soils (such as in mulched or irrigated areas) and so they may be less likely to travel to stations in the drier areas. 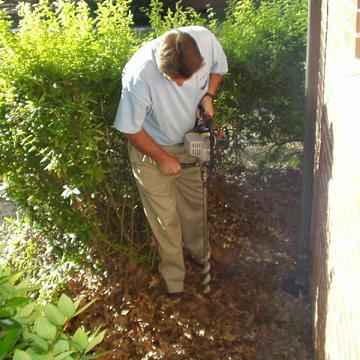 Using a soil auger to install termite bait stations. Unlike most conventional insecticides, the impact of termite baits is not immediate. By design, the insecticides used in the baiting systems are slow acting "insect growth regulators" (IGRs) so that the bait can be spread by the foraging worker termites to other members of the colony that do not collect their own food. This includes the reproductives (the "king' and 'queen') and the soldier termites, as well as those workers that maintain the nest and tend new offspring. Unlike more common insecticides, the IGRs disrupt the ability of the insects to molt which means that they only affect immature termites that are still growing (and molting). The IGRs do not affect the reproductives and soldiers. As a result, it may take several months before the entire colony is substantially reduced. As workers are killed, fewer termites are available to collect food and feed the rest of the colony. Eventually, the king and queen (and soldiers) starve to death. The time of year will also affect how quickly termite activity is eliminated. For example, if the bait system is installed in the fall against an active infestation, you might still see activity, including swarming (winged) termites in the spring. This is particularly true for the bait products that contain insect growth regulators (see product information below) that do not affect the adult swarmers. However, this same situation may occur even with a liquid treatment that is done very late in the year (or in the winter). The baiting program continues year-round as long as you maintain your contract with the pest control company. 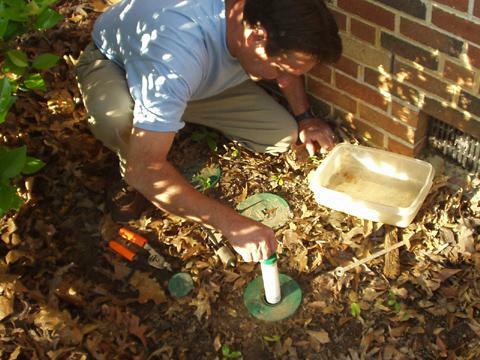 The key to a successful termite baiting program is proper monitoring and maintenance of the stations. Make sure you understand the monitoring/inspection schedule followed by the company and that you receive regular updates after every inspection, which may occur monthly or quarterly or at another preset interval. Treatment Cost - the initial cost of the baiting system may be higher than that for a liquid treatment. Termite treatments, whether they're baits or liquids, are labor-intensive and based largely on the dimensions of the house. The size ("footprint") and complexity of your home's construction can affect both baiting and liquid treatments in similar ways. For example, larger houses will require more soil-applied chemical or more bait stations in order to do the job compared to a house with a smaller footprint. However, the cost for a liquid treatment can be affected more significantly by factors such as the type of construction. For example, drilling and treating concrete slabs, such as garages, porches and patios, and masonry voids (block foundation walls) is required under North Carolina rules (and often by the product labels). This increases both labor and chemical costs. 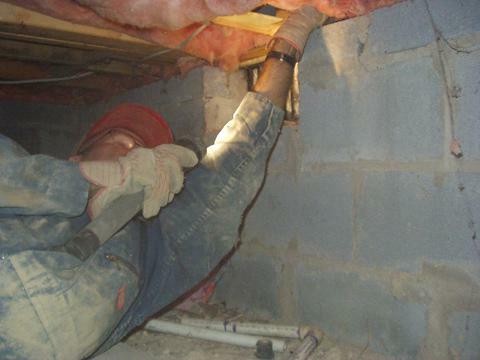 Also, since liquid termiticides are applied to a vertical area of soil and must reach a certain depth (4' or the top of the footer, whichever is less), a basement house could cost as much as 4X more to treat compared to a crawlspace or slab house of the same size depending on how deep (below grade) the basement extends and if drilling is needed. As noted earlier, in many instances a house may not "treatable" with a liquid termiticide (e.g., wells under the house) OR a liquid treatment may be difficult or environmentally questionable. In these situations, the seemingly higher "cost" of a baiting system must be weighed against its benefits in protecting you and the environment. Contract Maintenance - You can probably go anywhere on your property and find termites, but that doesn't mean that they are constantly attacking your house. It does mean that there is always a chance that termites may find a way to invade the house. Although we expect liquid termiticides to remain effective in the soil for at least 5 years (usually longer), this does not guarantee that termites will not invade your house for 5 years. An annual inspection is the only way to maintain that level of protection on your house. As with the termite treatment itself, the cost of the annual contract renewal can be affected by factors such as type of construction which can impact on the extent of any post-treatment routine inspection. For example, certain types of slab homes as well as homes with finished basements have far less exposed areas where you might be able to detect termites when they first invade the home. Pest control companies may charge more for an annual contract simply because of the greater risk (to them and to you) if they cannot detect termites in a timely manner. It is somewhat similar to having higher medical insurance premiums because of some previous health problems that make you a greater "risk" for certain medical problems in the future. The renewal for a baiting system contract is likely to cost 2x-4x more than one for a liquid treatment because the bait stations are typically checked at annually or as much as four times per year (more frequently when termites actually attack a station) whereas houses treated with a liquid soil treatment are inspected annually. The number of yearly bait station inspections is dictated by the product label. Also, with a termite baiting system, if you discontinue your contract, then the company usually removes the stations or simply stops servicing them. Depending on when the house was last treated (and with what chemical), quite likely you will be left with little, if any, chemical protection against termites and you may well need to have your house retreated conventionally at some point. The bottom line is that termite baiting requires a long-term commitment on your part. Take this point into consideration when making your decision. NOTE: If you decide that you prefer the baiting system approach, make sure that your contract includes an annual inspection of your house. No chemical termite treatment, whether it's a liquid or a bait system, is going to be 100% effective every time. If there is termite activity in your crawlspace and it's ignored for many years, you could end up with serious damage. An annual inspection of your house is critical - make sure that the pest control company provides one. Inspections are important for effective termite control. If you're not clear on any detail about the product ask questions before you sign the contract. If a professional inspection of your home confirms the presence of termites, some sort of corrective measure is strongly recommended. Your efforts and monetary expenditures are probably best spent on getting the best possible professional service that you can find. Termite control, whether it is through the use of soil-applied liquids, bait products, or other recognized mechanical methods is best performed by a trained and licensed professionals. Tips on Selecting Pest Control Services.